When one first starts learning how to fly catapult gliders the issue of launching handles is raised. Below are the AMA rules about launching and launching devices for Indoor Events and Outdoor Events. 6. Launching. Launching shall be appropriate to the class of model. In all cases, the launch shall be made with force sufficient to cause the glider to immediately gain altitude equal to three (3) times the flier’s height or half the available ceiling height, whichever is less. The model shall not be launched from a height greater than the flier’s normal reach above the floor. a. Hand-Launching. The model shall be released into flight directly from the hands of the contestant, without other assistance. b. Catapult Launching. 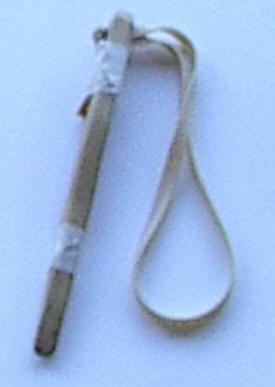 The model is launched by stretching elastic band(s) between the hands of the contestant, with one end(s) firmly attached to a launching handle. The handle shall consist of a rigid dowel or similar device, with the elastic band(s) firmly attached. The launching handle (including the attachments for the elastic) shall not exceed six (6) inches in length, measured along the longest dimension. The handle may use padding or contoured grips for flier comfort. There is no limit to the length or sizes of the elastic bands. All launching apparatus must remain firmly attached to either the handle or the model during launch. There is no limit to the number of launching handles a contestant may use to complete his/her flights. 4. Launching. Launching shall be by means of a hand-held catapult, as described below. During launching, the contestant must hold the catapult in one hand and release the model from the other hand. 4.1. A hand-held catapult is composed of a dowel not exceeding six (6) inches in length and a two-strand loop of 1/4 inch flat model airplane rubber (FAI, Pirelli, etc.) made from a piece that is 18 inches long to form a loop about nine (9) inches long. One end of the rubber loop shall be attached to one end of the dowel. 4.2. The hand-held catapult is to be provided by the contestant but is subject to approval by the Contest Director. More than one (1) hand-held catapult may be used in any given contest. One can quickly see by reading the above rules that the Outdoor launch handle is limited to a 6”long dowel with ¼” rubber band 9” long. The indoor rule allows more freedom about the rubber band(s) that can be used and is just limited to a 6” handle. A slightly more complicated handle has a spot of some clay. Clay is typically used to change the CG during trimming of the model.. So, it is very convenient to have some clay on your handle. Then there is the shorting of the rubber band(s) (typically for indoor). Here one shoots up a model pulling the model back as far as one can before releasing it. If the model does not hit the ceiling one can shorten the rubber band (typically by wrapping it once or twice around the dowel rod) and launch again. If you can still pull back the model the same distance back as before (without the rubber band breaking) then with a shorter rubber band the model will go higher. With this technique (with trail and error ) one can get very close to the top of the ceiling. Pictured below is the typical Outdoor-launching handle. The type of handle is also commonly used for indoor flying. Now some of us have decided to make some fancier launching handles. One first thinks about a handle with a more comfortable grip. 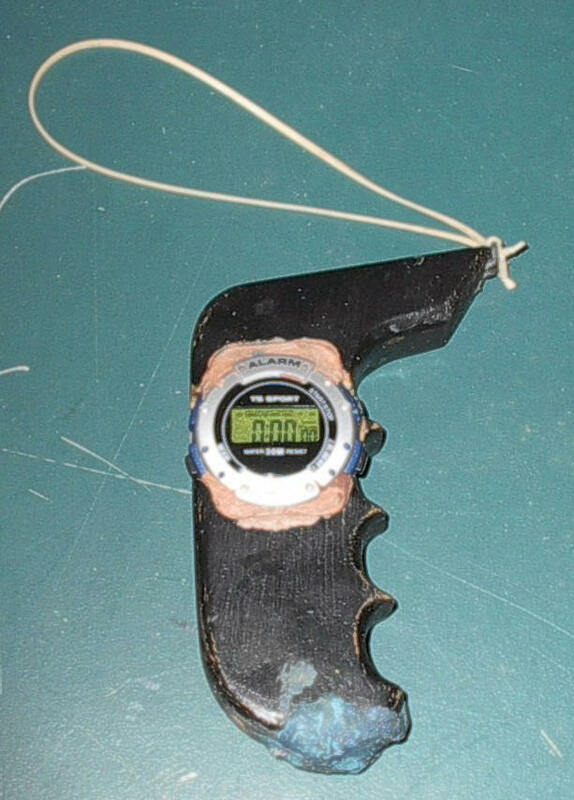 Then the addition of a stopwatch is nice so one can time practice flights without bothering a fellow flyer of spectator. Below are some pictures of “fancy” handles. The bottom line is that the launching handle is not going to really effect your times. It even turns out that the rubber band(s) are not a large factor either. You do need a rubber band(s) that can either gives you enough force to get to the top of the ceiling or to cause your plane to flutter. Also pull back as far as you can before you release.